As a vertically integrated manufacturer, we can continue using testing and field results to improve our production processes. Rework rate of our second generation modules (e.g., BT832) is in PPM (Part Per Million) range not in "%". As an electronics manufacturer since 1990, we know field failure rate is lower when rework rate is lower. We can layout basic PCBs. If you need high density and high precision PCB layout, we are one of best choices. We offer PCBA prototyping services to our module customers. We are more knowledgeable than other PCBA factory on loading your testing firmware into module. We can develop demo quality hardware, firmware, iOS app., and Android app.. We deliver all schematics and source codes to you. You will complete product development. Turn-key product development services are available. With an office in Scottsdale Arizona and a factory in Shen Zhen, China. Our customers don't need to go to China to get low price manufacturing services and PCB prototyping services. Our factory, located in Shen Zhen, China (about 60 miles from Hong Kong International Airport) is certified to meet ISO 9001 engineering and manufacturing requirements. The 60,000 square foot facility is equipped to manufacture RoHS compliant products. We began production of telecommunication products in 1993, our experienced team of electronic, mechanical, and production engineers are ready to support production of electronics products. Precision SMT equipment to handle BGA with 0.3 mm pitch or passive components as small as 01005 size. 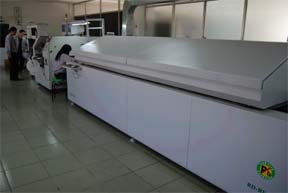 Reflow oven with 12 heating zones and 4 cooling zones. Panasonic SMT equipment to handle 01005 passive components and BGA with 0.3mm pitch. Using X-ray to inspect soldering quality of BGA chips. With more than 20 years of manufacturing electronic products in Taiwan and China, we have partners developing tooling's and making plastic and metal parts. We provide turnkey services for production of electronic products. Please contact Fanstel for any services needed. The Restriction of Hazardous Substances in Electrical and Electronic Equipment (RoHS) Directive was passed into law by the European Union (E.U.). It affects manufacturers, sellers, distributors and recyclers of electrical and electronic equipment containing lead, cadmium, mercury, hexavalent chrome, polybrominated biphenyl (PBB) and polybrominated diphenyl ether (PBDE). As of July 1, 2006 the use of these materials is banned in new products sold in Europe. Fanstel is committed to protecting people and the environment and we have identified materials used in our processes that could pose a potential hazard to our employees, customers or the environment. In 2005, Fanstel began the process of converting all of its products to be built without any of the banned materials. Qualification of RoHS-compliant components supplied by our vendors and the implementation of new manufacturing processes related to this Directive was undertaken in 2006. All of Fanstel's products and their packaging materials sold to Europe became fully RoHS-compliant on July 1, 2006. All of Fanstel’s wireless modules and IoT products are RoHS compliant. A Declaration of RoHS Compliance can also be provided. If you have questions regarding the RoHS compliance of our products, please contact Fanstel by email: info@fanstel.com.